Cremation services are changing the way we make funeral plans today. Whether you are planning ahead and considering a cremation plan for yourself, or have an immediate need for an affordable cremation service, DFS Memorials can help you save money. A simple, direct cremation service at-need can be arranged now for $975. Call now if you require immediate assistance with making disposition arrangements. Deciding whether to bury or cremate is a personal choice. For some families the decision is dictated by the budget they have for a funeral and a cremation service will cost less than a traditional burial funeral. On average a cremation service is going to save you at least 40% on the cost of a burial, sometimes you can save as much as 60% on the cost of a burial service. More families are choosing cremation as it does offer a greater flexibility. The funeral service does not have to go ahead immediately. Instead a cremation can be performed and the immediate disposition of the body dealt with and then a service held at a later date convenient to the family. The economy has definitely impacted on how we are changing our approach to death care today. Many families simply cannot, or do not, want to spend unnecessarily on funeral costs. A cremation provides a simple, efficient and economical means to conduct a disposition. How much does a funeral cost in Fort Wayne? How much does a cremation cost in Fort Wayne? A cremation WILL save you on funeral costs. There is no requirement for a casket, cemetery plot or burial vault, which alone saves thousands of dollars. Generally embalming is not required when a cremation is performed, so all-in-all you can save on many funeral expenses, meaning that a cremation will cost at least half, if not less, than the full cost of a burial funeral. It is important to state that cremation prices in Fort Wayne DO vary considerably between funeral homes, and depending what type of cremation service you opt for. Not all funeral homes have their own crematory but will use the services of a local crematory. The average cost of a cremation memorial is $4,593*, however, it is possible to find much lower-priced cremation services in Fort Wayne. 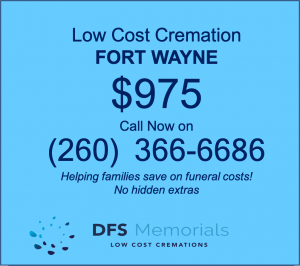 How much is a direct cremation in Fort Wayne, IN? A basic cremation can be conducted in For Wayne for as little as $975 complete. This is what is known as a “direct cremation”. No services are performed, the deceased is collected, transported to the funeral facility, prepared for cremation and the cremation is conducted. The cremated remains are returned to the family in a temporary plastic urn. If desired the family can arrange a brief final goodbye viewing at the funeral home. What type of cremation services are available? You can select from a range of cremation services and packages. These will start with a basic cremation without any additional services, which is the cheapest type of cremation package. You can have a full service funeral that is followed by the cremation, a cremation followed by a memorial service, or just a viewing followed by a cremation. Cremation does offer versatility in what options you have, and when and where any services can be held. As mentioned the cost of a cremation can vary enormously – for the exact same service – but from different cremation service providers. Ensure that you compare like-for-like services. 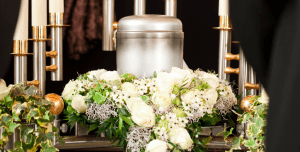 Some cremation service providers include crematory fees and cremation container costs in a direct cremation package, and others do not always include these fees. Death certificate fees and cremation permits are often additional ‘cash advance’ items. How do I know that the cremated remains I get back are my loved one’s remains? This is probably the most common cremation question we are asked. Strict laws govern the cremation of human remains and identity checks have to be made along the way. The cremation retort has to be completely cleared following a cremation and only one cremation can be performed at a time. The remains are cleared into a machine that filters out any metal parts (tooth fillings, hip replacements etc) and then ground into the fine ‘dust’ that is returned as cremation ashes. As mentioned above, there are laws in place regarding the cremation of human remains. A cremation cannot be performed until a cremation permit is issued by the medical examiner’s office. The legal next of kin must sign a Cremation Authorization Form. There is a mandatory wait period of 24 hours after death in Fort Wayne before the cremation can proceed. It is not necessary to embalm a body for cremation and refrigerated storage is used to preserve the body until the cremation is performed. The funeral home will generally store the body for up to 5 days in refrigerated storage at no extra charge. If the cremation does not go ahead within 5 days, an additional fee for storage may be incurred. What can we do with the cremated remains? Cremation offers some greater flexibility in what you can do with the cremated remains once you have them returned. You can, of course, inter them in a grave plot or niche. However, you can choose to store them in an urn at home or scatter the cremated remains. There are also options such as having cremation artifacts made from cremated remains such as cremation diamonds, glass jewelry, bird baths and paintings. If you wish to preplan a simple cremation you can lock in a low cost cremation price. This may depend upon your age at the time of setting up a prepaid cremation plan. A cremation plan can be set up using an insurance policy where the funds are put into a trust. You can also opt to preplan your cremation service without prepaying. This ensures that your surviving family can proceed with arrangements at the time of need, without having to worry about completing the paperwork or making difficult decisions. The money to pay for the cremation can be put aside in a POD account (Payable on Death) which your beneficiary can draw out upon death immediately without probate. The deceased had no life insurance – is there any help with cremation costs? It is sadly a reality that more folks are passing without leaving the means to pay for their funeral. If you are faced with this situation, you need to explore what help may be available to you. Social Security pay out a $255 lump sum death benefit (if you qualify) and your funeral director can assist you with this. The deceased is at the Medical Examiner’s Office. What do I do? If the deceased was the victim of a crime, or there were unusual circumstances surrounding the death, the deceased’s body may be taken into the care of the coroner for an examination to determine the cause of death. You will need to employ the services of a funeral director as soon as possible to coordinate the release of your loved one from the ME’s office. A deceased person can only be released into the care of a licensed funeral director. Many funeral homes are familiar with the process to liaise with the ME to have the body released as quickly as possible. You may also find that a simple, direct cremation can be arranged at a very low cost when the deceased is in the Coroner’s morgue as all the paperwork can be expedited quickly and the process to transfer the deceased to the funeral facility is simplified. We hope this short guide has helped answer some of your immediate questions, and provided some help to understanding how you can arrange an affordable funeral or cremation service in Fort Wayne, IN. If you need to research more information on funeral-planning, please visit the Library section on US Funerals Online. This entry was posted in Cheap Cremation, Cheap Funerals, Cremation Providers, Finding a crematory or cremation provider, How to Save Money on Funerals and tagged affordable funeral, basic cremation, cheapest cremation, cremation costs, cremation plan, direct cremation, funerals costs, help with cremation by Nicole Pelling. Bookmark the permalink.